With a two hour (or more) commute each day and at least a 20 minute checkout line every time I'm in not-so-desperate need of a Trader Joe's restock, it's become apparent I tend to blow through books faster than most. And since I walk the line between sound-of-mind late twenty-year-old and mentally decaying geriatric patient, its necessary to keep a running list on my phone of the books I still need to tackle in order to keep up with all the bibliophiles in my life. Now I can't say all the books that have been recommended to me are ones I too have loved, but they're usually better than the rando books with the visually striking cover I plucked from the library shelf. Every month I'd like to recap the books I've read and my thoughts on each. Some months may have more than others -- I'm looking at you October and all 1,138 pages of IT. Think of it as a monthly book club of sorts. Except I'm not telling you the book in advance and there's not gossiping over wine included. *Harry Potter and the Chamber of Secrets, by J.K. Rowling is freaking great. I mean, its Harry Potter. I can't actually remember if I finished this book in December or January, but at any rate, its great. I decided to re-read the whole series for the first time since 5th grade and MAN its amazing how much of a storyline you can forget in 19 years, even if it is one of the most culturally relevant pieces of fiction. For the most part its like I'm back in 4th grade hiding under my covers with my flashlight so I don't wake up my sister in the bed next to me. I couldn't put it down! *Harry Potter and the Prisoner of Azkaban, by J.K. Rowling was my favorite book in the series as a child. I flipping loved Sirius Black. Perhaps my bad boy phase got an early start? Re-reading it, Sirius is still my favorite, but I think Lupin has definitely risen in the ranks. *Harry Potter and the Goblet of Fire, by J.K. Rowling is where the books start to get heavy, both physically and emotionally. I still have the original hardbacks my parents bought when we were kids and they are falling apart. Luckily the glue on the spine of these books has been getting weaker and chunks of the book started pulling out. I was able to bring sections with me in my purse, which helped ease the misalignment in my spine from carrying a 24lb book each day. And yes, I looked deranged reading the sections in public, but like most things in my life, no fucks were given. *Harry Potter and the Order of the Phoenix, by J.K. Rowling had me welling up on the train. Its a children's book for Christ's sake and I'm over here, in public, with tears in my eyes over the death of Sirius (if that's a spoiler for you at this point, I'm not your only problem). And that's coming from someone who very rarely cries. Ask my sister, its true. At this point in the game, I'm basically making PSA announcements about how wonderful HP is to anyone and everyone. And for the record, I'm currently engaged to a man who refuses to read them and its a serious point of strain in our relationship. *Harry Potter and the Half-Blood Prince, by J.K. Rowling was the book that had me blurring the lines between our current political climate and a fictional story line revolving around magic and wizardry. I'm not saying there is a relationship between our current leader of the free world and Lord Voldemort buuuuuut I sort of am. I digress. At this point in the HP saga, everything I was thinking revolved around HP. All I wanted to do was go home and read. My days began to revolve around HP. Come to think of it, is this the definition of a cult? 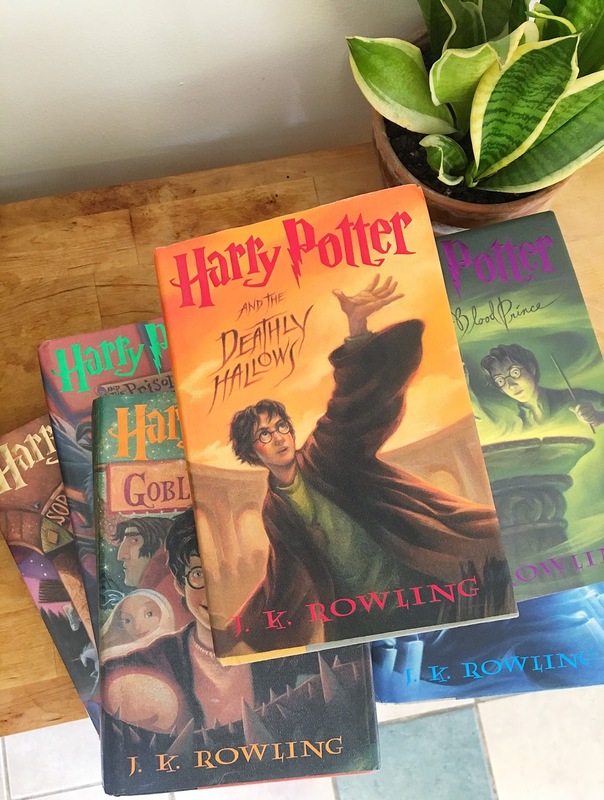 *Harry Potter and the Deathly Hallows, by J.K. Rowling left me feeling empty inside. What am I supposed to do with my life now?! I almost didn't want to finish the book, just so I had something left to live for, you know? Fun fact, someone saw me reading this on my morning commute and GAVE UP THEIR SEAT so I wouldn't be inconvenienced by holding a heavy book while standing. That never happens and quite frankly, it was one of the best things that's ever happened to me. *Amanda Wakes Up, by Alisyn Comerota was our book clubs January pick. We didn't end up having book club this month, and it took forever for me to get a copy from the library but I did manage to finish it on the cusp of February. Conveniently I got the digital download of the book, so I was able to read this on my phone in between my Harry Potter binges. It was a very easy read and similar to HP, had me finding parallels between the fictional story line and our recent political climate. I can't say I'd recommend it to a friend, but it was engaging enough to hold my interest. Have you read anything worth recommending lately? Leave a comment below with whats on your reading list.